Superimposed on the human city is an entire crow city, divided into family territories. During the day, families work in the neighbourhoods; at night they return, 6,000 strong, to their communal roost. Vancouver’s crows have allowed the rock doves only small slices of territory. Two blocks away from Sophia Street, doves nest on commerce-oriented Main Street. This has suited the doves; concrete building ledges are among their favourite places. Last week on Main Street, I saw a crow beating up a dove. A few days later, I saw a dove’s flight feather on the street. A few days later, I saw some more. Grey, black, brown, white, striped, spotted – representing all the dove colour variations. Near the scene of the battle, I found a single crow feather. Maybe the feathers mark the beginning of the fall moult. But to my worried eye, they look like casualties. 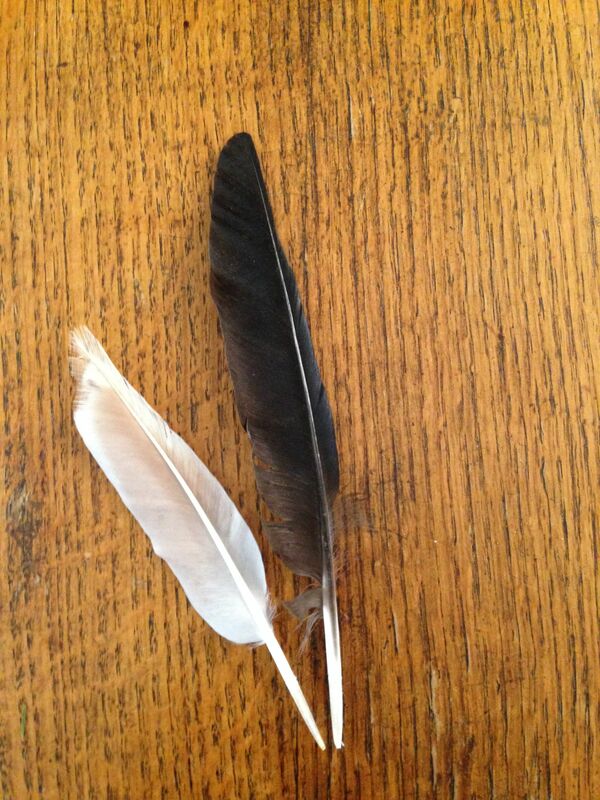 I brought home one dove feather along with the crow feather. On my table, I arranged them in a personal performative prayer for peace. During this private ritual, I prayed for their flocks and for embattled human communities. My cat Keely, however, has a world view all her own. She knocked both feathers off the table. In a series of games, she imagined herself a mighty warrior, a powerful hunter, master of her regional ranch-territory. And she ripped both feathers to shreds. Friends, take from this real-life parable anything you wish. Maybe crows are like militarist “hawks,” trying to silence the pacifist “doves,” who already occupy only a narrow spectrum of public discourse. Maybe local crows and doves play out something like the Israeli-Palestinian conflict. Depending on your perspective, Crow could represent either Israel the occupier or Arab League the intimidator. Or both, at different times. Maybe Keely the cat represents large regional powers happy to use smaller warring countries for their own ends. Maybe she represents terrible, destructive forces awakened by war. Uncontrollable inner and outer forces, damaging individuals and communities, leaving scars for generations. We see how Thucydides’ words have been enacted on the ground in the Middle East. Slogans and euphemisms dominate political pronouncements. Retaliation precedes investigation. Fear of humiliation trumps moderation. Sad and terrible, and also understandable. Thucydides’ words have also been enacted on the internet in North America. People freely call one another “Nazis.” Some people use “Zionist” as a synonym for “agent of evil.” Others belittle anyone who argues for peace, and vilify anyone who expresses sympathy for all human beings. Please, friends, let’s not let our inner cat warriors destroy us, like Keely destroyed the feathers. Let’s not let the hawkish inner crow conquer the entire territory of our psyches. We can acknowledge that war and images of war do raise terrifying inner forces. But if we can also be conscious of what is raised, perhaps we can leave some space for our inner doves. Because if we don’t, we risk dividing even our own local communities into camps where no one trusts their fellows. Beautifully said. However, I think our culture now is addicted to the “re-traumatizing,” effects that bombard us from all angles, not just social media. Until we see that what we do is reiteration of the abuse that many, many have experienced and which the marketing world thrives on, we will never get enough of the conflict between the crow and the dove. The crow is what we are as a culture in relationship to the dove of nature and those parts of us that carry the wound of those traumas. Thanks for the wonder full images! This is a very deep point, Jim. Thank you. Working on one’s healing really does require a new relationship to the world around us…which you explore so well in your writing. Powerless to effect peace my heart weeps for the pain that war brings to all its players. I’m stuck, no longer able to comment. I’m stuck, no longer able to watch and read. My voice and my gift for analysis of issues at the heart of this war have been lost to that powerlessness. I have lost my voice to my inner compassion. I don’t understand hate. Is hate part of being human? I hope not. I dare not think of myself as less than human. Am I a dove? A crow? A cat? Surely not a cat. Digging deep into my psyche I find the dove. Yet I suspect that if I were physically caught up in the middle east conflict my crow would emerge. Laura, your gift for metaphor is felt personally. You enable me to find words for my despair. Thank you. Leora, thanks for your beautiful and accurate words about how the discourse paralyzes us. I could not see you, in any situation ever, losing your ability to see from multiple perspectives. But I do agree that we would all be much more hard-edged if grief, suspicion, and constant vigilance were the mainstay of our inner experience. There was a great Star Trek: Next Generation episode about this, showing all the main characters in an alternate universe where the Federation was constantly at war. I hope that your dove continues to fly. May a way out of this sad and terrible crisis be found. And – the only real concrete point I’m sure of – may Rabin’s vision be reborn in Israel. Reb Laura, I am about to turn sixty, and the only thing that keeps me from despairing for the world is pausing a moment to consider how far it has come since I was a boy. Amen v’amen. Thank you for this beautiful post.